Diesel spill incidents caused by irresponsible marijuana growers in both Fortuna and Salmon Creek are in the headlines today. The Fortuna incident actually occurred late last year, and Lucas Hall, a Fortuna marijuana farmer, has been cited for multiple environmental violations after his improperly buried diesel fuel tanks leaked enough of the fuel into a nearby creek to warrant a fines totaling $156,446.00. The other incident is more recent and involves yet another marijuana growing operation running on diesel generators in Salmon Creek. Environmental authorities figure at least 1,000 gallons of diesel fuel have already leaked into Hacker Creek and the surrounding area, and the damage covers at least a few hundred meters between the fuel tanks and into the creek. Residents near Hacker Creek actually pump water from the stream into their homes, and the area is remote enough that some neighbors don't even have phone lines. This makes it difficult to warn those people that their drinking water has been contaminated by a careless pot farmer. It is truly sad that this is the way things sometimes go down around here. We can't help thinking that if the county showed more official support for marijuana growing then maybe fewer residents would try to hide their operations by burying illegal diesel generators and fuel tanks. 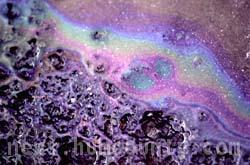 There must be a half dozen cannabis related diesel spills each year, and that's only what we know about! Is there any solution to this problem? Obviously the hillfolk will continue to grow pot no matter what, so maybe we need our environmental officials to publicly announce that they will offer help and support to remote growers in an effort to protect the environment from noxious chemical spills. yeah they should definitely enforce codes and requirements like that upon delivery, but then, how do these back woods growers get their diesel? Do they have a delivery truck bring it out? i bet they buy big tanks for their pickup trucks and get the fuel themselves. that way no one knows where their grow operation is and they are less likely to get robbed. What's "truly sad" is that growing with diesel generators (or any form of electricity) in this part of the county is totally unnecessary. Unlike NoHum, there's ample, free sun all spring, summer and fall. Generators create an extreme environmental hazard for all of us, because EVERY creek flows to a river which dumps petropollution in the ocean. Even "clean" scenes with secondary containment are creating a fire hazard for the community they're in: things get crispy down here, without that coastal fog. The exhaust from generators is much more toxic than that from trucks, which have to comply with EPA emission standards. Gennys don't. Diesel exhaust contains dozens of known carcinogens and endocrine disruptors. Not to mention the noise, which affects not only humans who have to listen to it 24/7, but night predators like owls, bobcats, foxes and mountain lions. Indoor operations are a costly, resource-intensive way to grow a WEED. But financial incentive always seems to trump common sense. Lucas Hall Is the land owner. The land was leased he did not live on it, and has not been found guilty of anything. As a land owner he agreed to a settlement trying to do the responsible thing.There was no leak into a creek. But in America we are guilty until proven inocent that is why the police can keep getting away with what they do. There was NOTHING ilegal found In MR. Hall's home in Fortuna. But that did not stop them from arresting him and his wife. In America you can not legaly have cash because you must of done something against the law to have it so they take it. "It could be you next"
For excellent coverage of the Hacker Creek incident, see "Redheaded Blackbelt"'s blog: she's a local who's been out to the site numerous times.